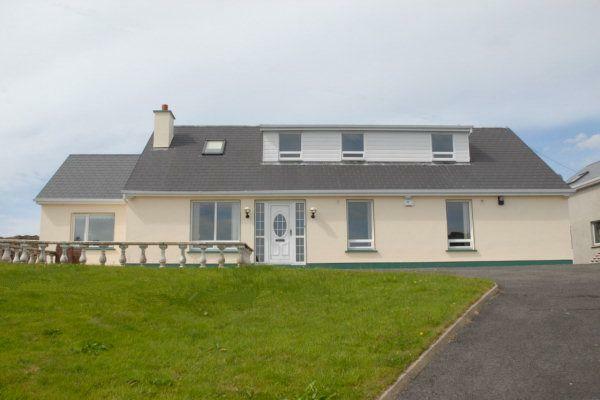 Superb four bedroom bungalow overlooking Donegal bay, Teelin Harbour and Slieve League. Located in the very scenic south-west Donegal. On over an acre of professionally landscaped grounds. Ideal base for touring Co. Donegal. The wonderful gardens overlook Teelin Bay, which is nestled between the gardens and Slieve League. Must be seen to be appreciated! Spectacular landscaped grounds incorporating a private area for sun bathing. Incorporating natural stone seats and incorporating a good variety of native plants, the gardens were designed to achieve a natural feel. There are also megalithic artefacts in the Kilcar and Carrick area and the gardens at the house in fact overlook a Cashel or ring fort. There are 2 convenience stores located in Carrick, which is c.1.6 km (1 mile) from the house . For more general shopping, there are a variety of shops in Killybegs which is c.16.5 km (10 miles away) or Donegal town, which is 45km (28 miles) from the house. Aspect: The house is situated on an elevated position in south-west Donegal between Killybegs and Glencolmcille. It overlooks Donegal Bay to the south and Teelin Bay to the west. The cliffs of North Mayo are clearly visible on clear days. Mountain: Slieve League is within a mile of the house (as the crow flies) on the opposite side of Teelin Bay to the house and gardens. Slieve League is 595 meters in height and is regarded as the highest sea cliffs in Europe. Traditional Music: This area of Donegal is among the best in the Ireland for traditional music. It has a particularly rich tradition of fiddle playing and festivals are hosted in Glencolmcille in July and August of each year while Carrick hosts a traditional festival at the end of October in each year. Gaelteacht (Irish speaking area): The wider area is classified by Irish governmental agencies as a Gaelteacht (Irish speaking area), though everyone speaks English too. Irish language courses are run throughout the summer in Glencolmcille, which is about 6 miles from the house. Scenery: This area of Donegal is one of the most beautiful areas in Ireland with notable wildlife and animals, which are sadly no longer seen or heard in other parts of the country. The Skylark and Cuckoo are but two of the many birds which frequent the area. Of particular note are the areas of Muckross Point, Carrick, Meenaneary and Glencolmcille. Beaches: A small beach is situate to the south of the house and located about a mile away. Also of note is Silver Strand at Malin Beg (west of Slieve League on the Glencolmcille side of the mountain). Note too Fintra beach which is situate between Killybegs and Kilcar. Hill Walking & Cycling: With so many lovely mountains and hills in South West Donegal such as Slieve League to the west of the house, the hills around Glencolmcille, Muckross Point near Kilcar, there is no shortage of hill walks. Errigal Mountain in the northern part of the county is also recommended. Note O.S. Discovery series map 10. Boat Trips: from Teelin bay around Slieve League are available for sightseers and anglers. Sea Fishing: There are numerous points for sea-fishing in this area from Killybeggs right around to Glencolmcille. The local pier at Teelin is recommended. Restaurants: Killybeggs, Glencolmcille (seasonal), Carrick: bar. Glencolmcille: Is world famous for its wealth of Archaeology. Monuments include standing stones, a Martello tower, old graveyards, and a folk museum village; the brainchild of the late Rev. Fr. James McDyre. Glencolmcille took its name from the Irish St. Colmcille 521 AD. 1. Glencolmcille: Is particularly famous for its fiddle playing and hosts a fiddle school at the end of July every year. Traditional music is a feature in the public houses of Glencolmcille throughout the year and particularly so in the summer months. Glencolmcille is situated about 6 miles west of the house. 3. Kilcar: is the 1st village that the visitor encounters after leaving Killybegs. Kilcar also has a vibrant music scene, especially during the summer months. It is situate about 5 miles from the house to the east. 4. Teelin: “The Rusty” public house is world famous for its music. Teelin is situate about a mile across the bay from the house and is about 3-4 miles by road. 5. Meenaneary: is a small village situate to the north of the house and hosts its own music festival in June of each year. The Gaelteacht covers extensive parts of counties Donegal, Mayo, Galway and Kerry – all on the Western seaboard – and also parts of counties Cork, Meath and Waterford. Although all of the Gaelteacht population speaks English, these are the only parts of Ireland where Irish is still spoken as a community language. The preservation of the Gaelteacht as an Irish-speaking community has been regarded by successive Governments, as of utmost importance since the foundation of the State. Not only does the Gaelteacht present on opportunity to naturally maintain the continuity of the Irish tradition, but also provides the ideal environment for the people who wish to become proficient in the Irish language. Extra: Electricity is operated by €2 coins. This is full on arrival and should be left full on departure. Extra: Heating oil is metered, the cost of which is passed on, on a per liter basis.